Selected reaction monitoring mass spectrometry (SRM-MS) is a highly selective and sensitive method used to quantitate protein/peptide abundances in complex biological samples for targeted quantitation of proteins. SRM-MS is commonly utilised for small molecule analysis and is now developing as a mainstream technology for proteomics. Scheduled SRM-MS assays are compatible with multiplexing, enabling the quantitation for 10s-100s of analytes in a single MS run.For absolute quantitative analysis, synthetic peptides containing a stable isotopically labelled amino acid are used as standards. 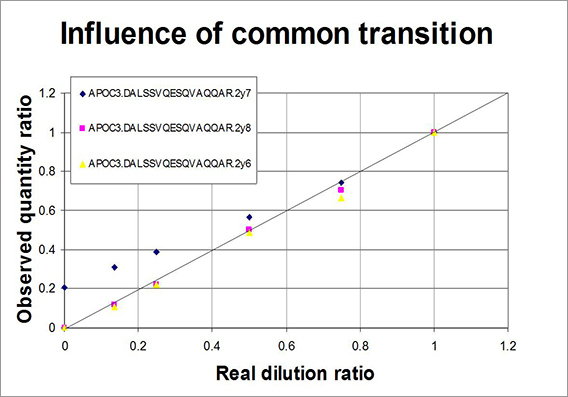 This enables the performance of each assay to be assessed for limits of detection/quantitation and linearity. 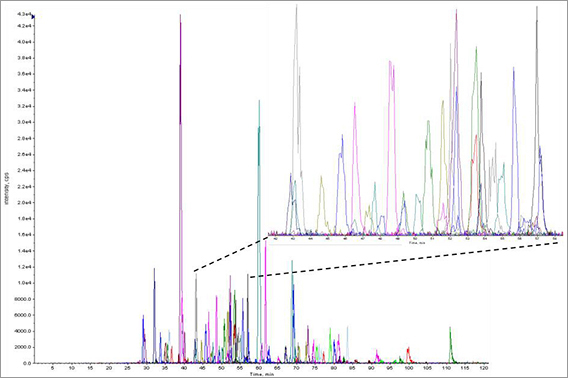 SRM-MS assays can also be used for relative quantitation of analytes across runs. At APAF we have developed over 200 SRM assays for human plasma and cell lysate proteins. With SRM, absolute quantitation is available however there are many pitfalls to the unwary that can compromise accuracy. A major benefit of SRM is the ability to multiplex many assays, allowing fast and accurate quantitation within the MS analysis. At APAF, if we can observe the peptide by MS we can develop an SRM assay for you.